In February, the U.S. Army asked experts for ideas on how to build a system that would allow tanks and other ground-combat vehicles to quickly and automatically “acquire, identify, and engage” targets. 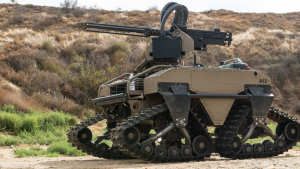 Some saw this as a step toward autonomous killer robots, leading the Army to now tweak its request. Yes, it now says, it wants bots to be able to identify and kill targets. But that doesn’t mean “we’re putting the machine in a position to kill anybody,” an Army official told Defense One. According to the Defense One story, the Army decided to revise its request for information to make it clear that the Advanced Targeting and Lethality Automated System (ATLAS) would not violate the Defense Department’s policy requiring that a human always make the decision to use lethal force.